If your child is diagnosed with Type 1 or Type 2 diabetes it can be a shock – and then learning to live with the restrictions of a special diet can seem stressful and complicated, especially if you have more than one child and they need/want different food. Diabetic children need to manage the amount of sugar and carbohydrates in their daily diet: carefully managed, the right diet can ensure the child grows and develops normally and has few or no health scares. This does mean that you need to make fundamental adjustments to the food you offer your family, with some basic rules predominating. Around 50% of a diabetic child’s calories should come from whole grains, fruits and vegetables with almost all the rest of the calories being provided by lean proteins and low- on non- fat dairy foods. It’s the amount of calories in each meal that allows you to monitor the insulin levels in the child. Sweets are no longer off limits and can be eaten as treats, once an insulin regime has been established. In addition, each child’s age and weight will determine how much they should eat, and this should be agreed with the dietician working on your child’s diabetes management plan. The old days of a ‘special diet’ for diabetics is largely over, and while the first few weeks or months may require you to keep your child on a limited food intake, you should soon find that a family-wide change in eating means you are all slimmer and healthier and the diabetic can eat almost everything that the rest of the family eats. You can turn your current family favourites into diabetic-friendly dishes quite easily – and the whole family may benefit as a result. Diabetic diets can ensure everybody in the household has a healthy eating pattern which is a long term investment in good health. Learning to modify your own recipes mainly involves either reducing the amount of sugar, fat and salt, and increasing the amount of fibre, or substituting less healthy ingredients for more healthy ones. It is a fallacy that people with diabetes should not eat any sugar – in fact they can actually need sugar, for example, before physical exercise which lowers blood sugar. Sugar does need to be limited, and you can use your old recipes to create new, more healthy ones that taste just as good. Try reducing the amount of sugar by a third, and if the recipe still tastes good, try reducing the sugar to half the original amount the next time you make it. Often you will find that using more spices and flavourings, such as ginger, vanilla and cinnamon will make food taste sweeter than you expect. Cakes can be boosted by the addition of stewed apple, pear or apricot to add bulk and moisture, and which allows you to reduce the fat and sugar content. This Christmas favourite can be made at any time of year for a treat, and is indistinguishable from the classic, more sugar-rich, version. Make up the jellies according to the pack instructions in a large jug and leave to cool. While you are waiting, spread the slices of cake over the bottom of a large glass dish and pour the orange juice over them. Once the jelly is blood temperature, peel and slice the bananas and layer them with the orange segments over the sponge. Pour the jelly over the top and leave to set. 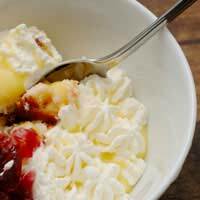 Blend together custard, fromage frais and crème fraiche and spoon over the trifle before decorating with fresh fruit or diabetic chocolate buttons.